Repairing fuel lines can often be problematic if the required parts are not readily available. 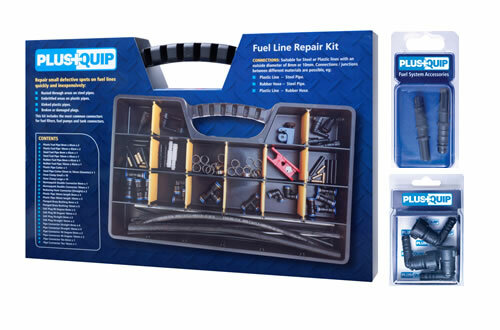 Now with the new PlusQuip Fuel Line Repair Kit smaller defective spots on fuel lines can be repaired quickly and inexpensively. The PlusQuip Fuel Line Repair Kit is designed to allow the technician to easily repair a range of fuel line issues including rusted-through areas on steel pipes, embrittled areas on plastic pipes, broken or damaged plugs or kinked plastic pipes. The kit is suitable for steel or plastic lines with an outside diameter of 8 or 10 mm. Connections between different materials are also possible including plastic line to steel pipe; rubber hose to steel pipe; and plastic line to rubber hose. The kit includes the most common connectors for fuel filters, fuel pumps and tank connectors. A full range of refill components are also available to replenish the kit as required. This new kit is available through specialised automotive resellers and leading automotive retailers.